This sport is a Canadian invention, having been jump-started by Bombardier’s invention of the Ski-Doo snowmobile. It became a major recreational sport in the mid-sixties, and has become a great family winter sport. 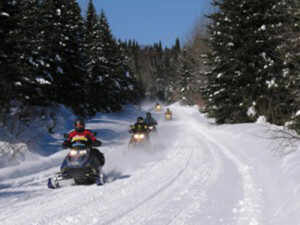 Some trails in York Region and surrounding area convert themselves to either cross-country ski tracks or snow mobile trails in the winter months. Trails may be open or closed depending on snow conditions. To find out where you can meet other beginners, enthusiasts or to speak to an expert please contact your local snowmobiling club. Besides meeting other enthusiasts, get access to safety information, training, and trail guidance and information. Please note that motorized vehicles are prohibited in the York Regional Forests, many conservation areas and parks. Please contact your local snowmobile club to learn where you can ride. *For safety, when snowmobiling, stick to marked/tracked trails, carry emergency food & fuel, and if in the backcountry, carry emergency transceivers. To snowmobile legally in Ontario you must be at least 12 years of age with a driver training course. You also need to have insurance and appropriate safety gear (e.g. helmets). Have fun and be safe!